If you are looking for a great boat that will play hard, cruise easy and fish great this is the boat for you. This boat has the following options; Urethane paint upgrade, Amped Package, Hydraulic steering with tilt wheel, Stainless Steel Cleats, Stereo with Bluetooth, Bimini Top, SST Prop, Bow Livewell, Upgraded Trailer. This boat is powered by a Suzuki 175HP Four Stroke. The Easy models are one of the most popular among the SeaArk Family. These models combine family fun and fishing! They continue to offer the toughness while featuring options that allow you to fish, ski, or spend a lazy day on the lake. Featuring a large livewell, lots of storage including rod storage, lounge seats, a removeable table, and large fishing decks. 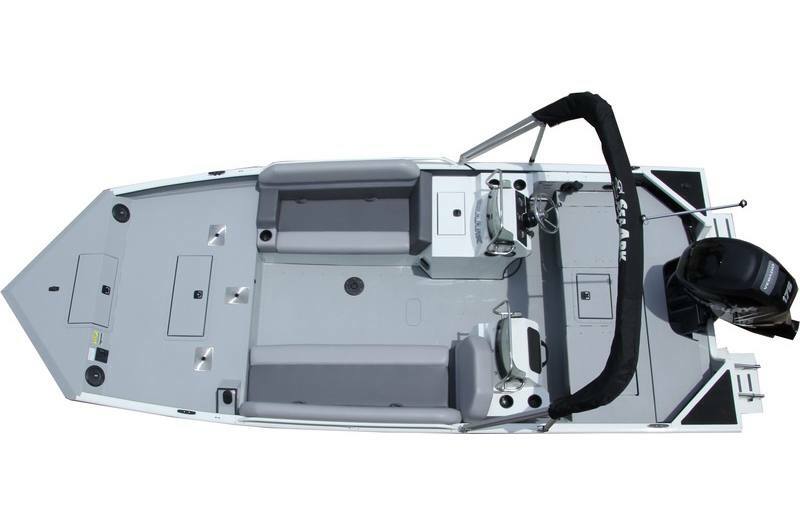 The 15° V-Hull gives you the smooth ride in heavy chop to ensure a comfortable day on the lake. Persons Cap: 8 persons; 1100 lb.